There is growing evidence that high levels of intense exercise may be cardiotoxic and promote permanent structural changes in the heart, which can, in some individuals, predispose them to experience arrhythmias (abnormal heart rhythm). A review published in the Canadian Journal of Cardiology explores current controversies and makes the case for investing in large prospective research studies into the effect of intense exercise on heart structure and function. There are unquestionable benefits to "getting off the couch." However, there is already fairly compelling evidence supporting the association between long-term sports practice and increased prevalence of atrial fibrillation, and the fact that this relates to chronic altered atrial substrate. Without challenging the undeniable evidence supporting low and moderate intensity exercise, this review by sports cardiologist André La Gerche, MD, PhD, provides a balanced discussion of the available data for and against the concept that intense exercise, particularly endurance exercise, may cause adverse cardiac changes in some athletes. "Much of the discussion regarding the relative risks and benefits of long-term endurance sports training is hijacked by definitive media-grabbing statements, which has fueled an environment in which one may be criticized for even questioning the benefits of exercise," explains Dr. La Gerche, who is Head of Sports Cardiology at the Baker IDI Heart and Diabetes Institute, Melbourne, Australia. "This paper discusses the often questionable, incomplete, and controversial science behind the emerging concern that high levels of intense exercise may be associated with some adverse health effects." As Dr. La Gerche points out, all available therapies, pharmacological or otherwise, have a dose-response relationship whereby benefits diminish at high doses and the risk of adverse events increases. An open mind would consider that this may even be possible for exercise. Is there a non-linear dose-response relationship with exercise? Elite athletes tend to live longer but is this the effect of exercise or other factors such as the absence of smoking and alcohol consumption? Is endurance exercise in athletes associated with arrhythmias? 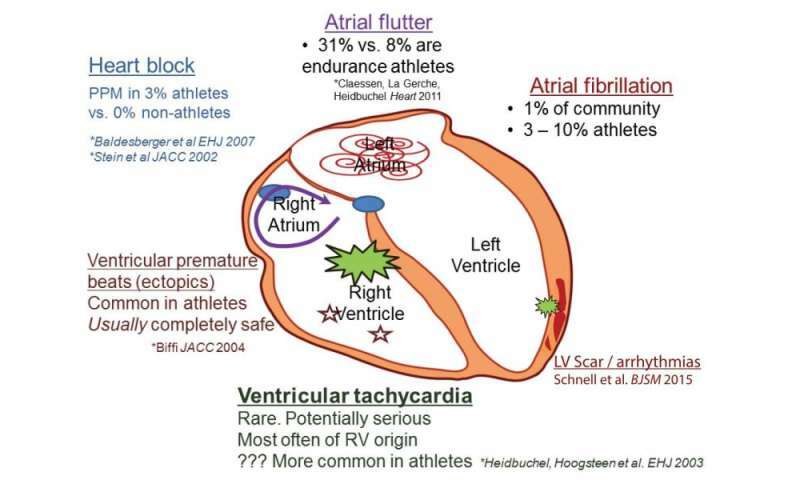 What are the potential mechanisms that predispose athletes to arrhythmias? Is chronic cardiac remodelling a consequence of repeated bouts of injury? Why is there disproportionate right ventricular (RV) injury following an acute bout of intense exercise and are there any long-term consequences? Is the risk of ischemic heart disease increased with intense exercise? Many of these controversies are based on small cross-sectional cohort studies and small mechanistic studies that are dwarfed by the large population studies supporting the benefits of exercise, albeit in doses of exercise less than those commonly practiced by elite sportspersons, notes Dr. La Gerche. "The answers regarding the healthfulness of 'extreme' exercise are not complete and there are valid questions being raised," continues Dr. La Gerche. "Given that this is a concern that affects such a large proportion of society, it is something that deserves investment. The lack of large prospective studies of persons engaged in high-volume and high-intensity exercise represents the biggest deficiency in the literature to date, and, although such work presents a logistical and financial challenge, many questions will remain controversies until such data emege." More information: "The potential cardiotoxic effects of exercise," by Andre La Gerche, MBBS PhD (DOI: dx.doi.org/10.1016/j.cjca.2015.11.010). Published online in advance of Volume 32/Issue 4 (April 2016) of the Canadian Journal of Cardiology.